Humanure Handbook, 1st Edition, is a Three Rivers Award Finalist in the Public Awareness Category. The Three Rivers Awards, centered in western Pennsylvania, is one of the largest regional environmental awards programs in the US. Humanure Handbook, 2nd edition, presented the Independent Publisher Outstanding Book of the Year Award Winner, deemed the book "Most Likely to Save the Planet" among a competition involving 550 independent publishers. Humanure Handbook, 2nd edition, is a ForeWord Magazine's Book of the Year Finalist competing against 1,000 other publishers. Humanure Handbook, 2nd edition, is a Publisher's Marketing Association's Benjamin Franklin Award Finalist for excellence in publishing, among 1,804 entries. Jenkins is a Three Rivers Environmental Award Finalist in the Public Awareness Category. 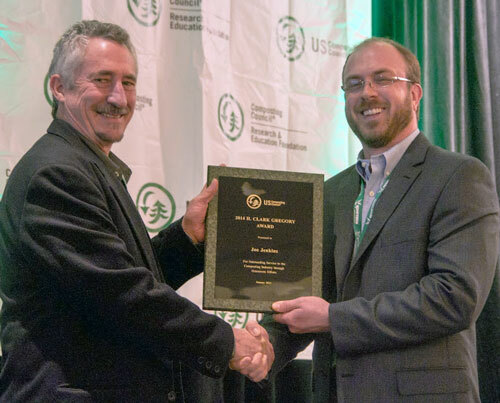 H. Clark Gregory Award: Awarded by the US Composting Council to an individual who has displayed outstanding service to the composting industry through various grassroots efforts, including backyard composting, vermi-composting, or public or end user education. A nominee must be active in one or more of these compost related efforts for a minimum of 5 years.